There’s been talk of it for a while, and with news that Barnes & Noble has invited the media to a special event on November 7, it seems almost certain that the bookseller giant will launch a new tablet to go up against Amazon’s Kindle Fire and Kobo’s Vox tablets. The invitation reads: “Please join us for a very special announcement.” And that’s pretty much it, although the large green “n” logo at the top of the invite further reinforces the widespread belief that the unveiling of a Nook tablet of some kind will be taking place. Taiwanese trade publication DigiTimes reported a couple of months back that something was afoot, suggesting that the “Nook Color 2” would sport a 7-inch full color touchscreen, just like the Fire and Vox tablets. While sales of books at Barnes & Noble stores have been dropping recently, the bookseller has been doing doing considerably better with its Nook and e-reader business. If a new Nook is unveiled on Monday, the bookseller will be hoping the tablet proves a big hit in the holiday season and helps build on the success of its existing Nook and Nook Color devices. Indeed, with three new tablets – Barnes & Noble’s probable offering, the Fire and the Vox – all being launched at about the same time and all vying for the same market, consumers looking for a low-end tablet will be spoiled for choice in the run up to Christmas. Kobo’s Vox tablet has 8GB of internal storage, runs a version of the Android OS and is priced at $199 – the same as Amazon’s Kindle Fire. The price of any new Barnes & Noble device will be crucial to its success. The Nook Color, which was launched in October last year, currently sells for $249, so unless there’s some serious price changes, it’s hard to imagine a new tablet from Barnes & Noble being priced as low as $199. It was reported on the weekend that shipment of the Vox had been delayed until next week, while the Kindle Fire is set to be shipped from November 15. 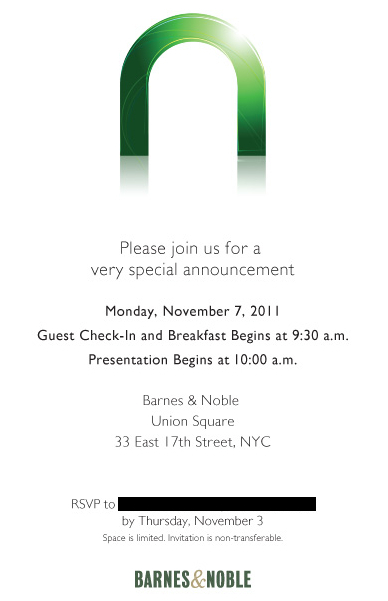 Barnes & Noble’s announcement will take place at its store in Union Square, Manhattan, at 10am on Monday.